Universal Boschi in collaboration with “ING. L. & A. Boschi” of Italy manufactures and exports air separation plants that perform in sync with the plants of international standard. With the Boschi technology, experience, resources, design and premium quality raw materials, our plants meet and exceed the expectation of our clients. Our company manufactures the air separation plants that create oxygen, nitrogen and acetylene from air via the process of compression, cooling, liquefaction and distillation of air. 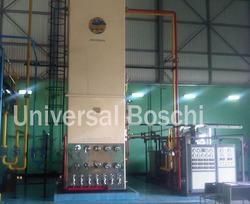 Universal Boschi is an esteemed supplier of air separation plants with (SGS) quality approval, ISO 9001:2000 certification and CE certification. Apart from manufacturing and exporting the products, we also offer consultancy, installation and warranty/guarantee services. Well equipped with the latest production unit, we manufacture the plants that are technologically advanced and yet cost effective. 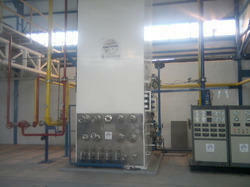 Our Liquid/Gas Air Separation Plants is designed in India and supplied all over the world. It order to make the machines technologically very advanced, we acquire technology along with designs from ING. L. A. BOSCHI of Italy. The Italian company is recognized for its uncommon technology since 1930. The capacity of liquid air separation machine varies from 30 m3/hour to 50,000 m3/hour so our customers need to first analyze their requirement and choose an appropriate one. The minimum life span of the machines is 20 to 25 years, but they are working exceptionally well for over 30 years. We use components from the international market to enhance automatic functioning of the machines. The machine generates liquid oxygen and nitrogen with purity upto 99.7% and 99.99% respectively. 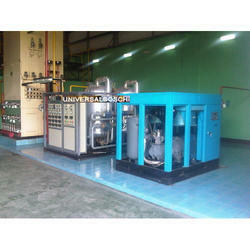 We use Atlas Copco compressor, which is of air cooled and oil free design. In addition, we use other components taken from known companies and raw materials from CE approved vendors. Our assistance does not end with the selling of the plants, we available for our customers in the time of need. Packaging Details: SEA WORTHY EXPORT PACKING. 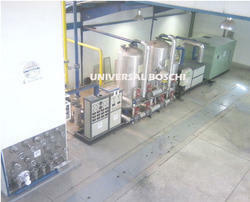 Universal Boschi manufactures and exports technically updated Cryogenic Air Separation Plant for its clients located all over the world. Boschi technology and design are worldwide popular since 1930, so we completely acquire his technology and design. With the years of experience and presence of technical workforce, we fabricate unmatched cryogenic air separation plant in terms of quality, reliability and durability. We are a lading and known company in the engineering sector for designing, developing and supplying technologically newer Medical Air Separation Plants. Before manufacturing the plants, we ensure to acquire technology from ING. L. A. BOSCHI of Italy as the company is popular in the industry since 1930. The output of the plant meets requirement of medical industry. The purity from the plant you can expect includes upto 99.7% oxygen and upto 99.99% nitrogen. Our medical grade outputs sre sure to meet the requirement of healthcare industry. The each manufacturing process of medical air separation set ups is supervised by a team of senior engineers in order to ensure no customer grievances. Since the outputs are approved for medical industries, we have a number of customers from healthcare industry. Anyone from anywhere in the world can get in touch with us either by calling directly or emailing to our customer care department. We work round the clock and serve each customer with 100% reliability. We are a leading company in designing and manufacturing Liquid Air Separation Plant. Our company manufactures and exports Industrial Air Separation Plants by incorporating technology as well as design from Dr. Boschi of Italy. The plants incorporate the latest Centrifugal Air compressors and are designed as per the Low pressure Boschi process resulting in high yield and exceptional performance. Our Industrial Air Separation Plants are operational for a number of applications such as Gas Distribution, Steel, Glass, Petroleum, Food and Beverages, Ship Breaking and Scrap Cutting. 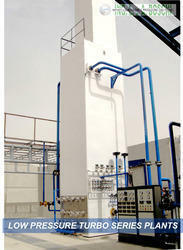 We design and develop Air Separation Machine that are uncommon in terms of technology, functionality, and performance. To acquire the best technology, we are technologically associated with ING. L. A. BOSCHI of Italy, a company in Italy known for its technology since 1930. We offer exceptional customer service so we have become popular all over the world. Our customers can get in touch with our customer care executives round the clock either by calling directly or simply sending by an email. Once we receive query, our technical department would start communication so that your each question gets properly solved. We have supplied the machines in Saudi Arabia, Indonesia, UAE, Dubai, Sudan, Iraq, Syria, Jordan, Maldives, Saipan, Seychelles, Kazakhstan, Malaysia, Taiwan, Nigeria, Ghana, Congo, South Africa, Benin, Europe, Libya, Columbia, Brazil ,ITALY, Peru, South America and many others. Air Separation Gas Plant designed and developed by our company is technologically latest as we are associated with an Italian company – ING. L. A. BOSCHI of Italy. Our Air separation gas generating machines guarantee of highly pure oxygen and nitrogen with purity upto 99.7% and 99.99% respectively. Being an esteemed company in the engineering sector, we take raw materials from verified vendors and components from the branded companies in order to stand our products ahead in this cut throat competitive market. International approach and well experienced engineer help our company fabricates technologically advanced and fully automatic machines and export them in the international market. Our plant has varying capacities, ranging from 20 m³/hour to 5,000 m³/hour, choose a machine that fulfills your specific requirement. We have formed an R D department that is well equipped with sophisticated equipment that works as backbone of our organization. On the other hand, the plants operate at a working pressure of only 6 to 8 bar. In the process of Air Separation Unit, nitrogen and inert gases, air separation unit use atmospheric air. The air separation units (ASUs) are built to provide nitrogen or oxygen and sometimes argon as well. The three main components of our atmospheric air include Nitrogen (78.1%), Oxygen (20.9%) and Argon (.9%). Cryogenic air separation uses the diverse condensing/boiling points of the components of air to let the separation takes place by distillation at cryogenic temperatures. 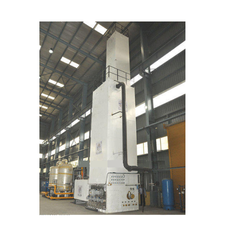 Our air separation unit is of high quality ensuring smooth functioning of the plants. In addition, we give a guarantee of longevity and high performance. Our engineers remain round the clock ready to serve our clients spread out anywhere in the globe. Our customer care department is customer centric and do not irritate in solving queries of our clients. Existing as well a clock either's potential customers can get in touch with us around the calling or send emails.